In order for Hotjar to connect Feedback responses submitted through Polls, Recruiters, and/or Incoming Feedback to Recordings, consent will need to be granted. This will allow the owner of the site to have a better understanding of the visitors overall experience. If you have not granted consent by selecting the “X”, your feedback will still be submitted, but there will be no User ID or searchable Recording associated with the visit. 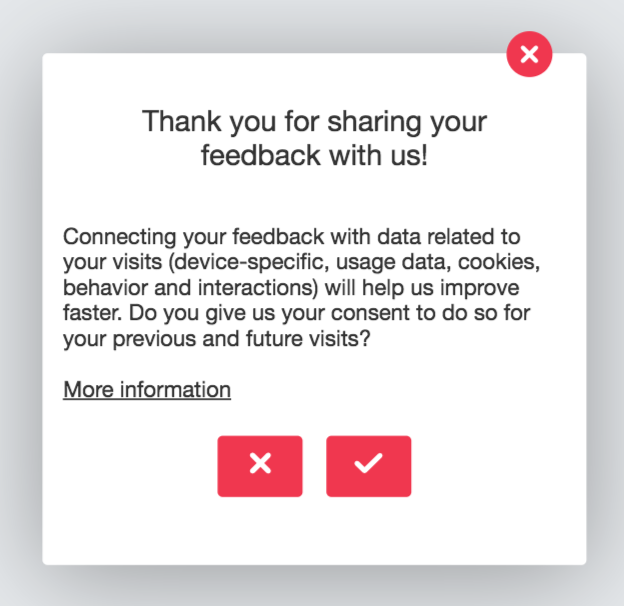 If you have granted consent by selecting the checkmark, the same User ID that is assigned to the Feedback response can now be assigned to a Recording that can display your behaviors and interactions on the site. This optional feature can always be disabled if you no longer want Recordings to be connected to Feedback responses. The Consent statement is not editable. If consent has not been granted, the User ID will be left blank on the Feedback results page. This will not skew the data in any way and the response will still be present, however, no user ID or Recording will be linked to that response. The only feedback tool that doesn’t offer this connection is Surveys which is due to the lack of User ID assignment. All Behavior and Interaction data collected will be retained for no longer than one year. It will then be automatically deleted. All Feedback responses data submitted is stored in accordance with our Data Retention policy. The right to withdraw this consent is present at any time. From the date when the withdraw of consent occurs, we will no longer combine Feedback responses with information about behavior. Any data collected and combined from the date when consent was granted until the date of withdrawal would have been lawfully processed.